Vanity Case. 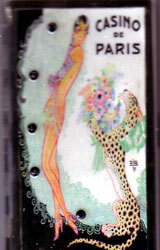 Fierce vintage image of Le Josephine with her pet leopard on silver finish vanity case. Inside of this fabbie flat case is a mirror and a clip; underneath clip are three leopard Sniff tissues. You also put a credt card, drivers license, business card underneath clips. Very handy for carrying in your purse or leaving on your dresser. Adorned with black crystals.